thing fast, on very strong fire and for a short time explaining that this way the fried is not harmful. According to them, this recipe is actually from Sichuan cuisine. Not that I understand them both. I do not avoid completely fried. Whenever possible. It is important not to overdo it. I did not find Sichuan pepper – pepper, which uses the seeds of the seeds, not the grains themselves. According to the descriptions, they are lemon-flavored and can be replaced by pepper melange, as I did. Peanut butter was not really looking – I prepared the chicken with sunflower and sesame oil. The latter is also very fragrant. In fact, I only needed it, because I have rice vinegar in the cabinet because of the dryness. 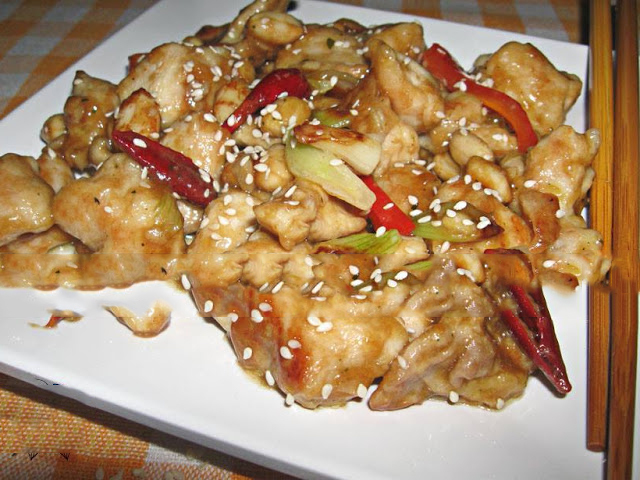 And once I explained what provoked me to cook this spicy chicken with the sound name of Gun Bao Dzhi, I would say that it is literally cooked for 6-7 minutes, with just as many minutes of preparation, and if you have a roast pan, or at least a big one , wide, in which the meat will not crush but will fry – it is even better, easily and quickly. Sodium glutamate from the recipe I followed (there is a clip there) I missed it – for me this “preparation” improves the taste of something not so well prepared and is superfluous. The thing I’m going to change next time – I’ll put the peanuts pre-baked. I ate meat with peanuts in the Chinese and were crispy; here they are fried, but they are not crunchy. Nothing that young people liked so much. The chicken is not hot. The peppers are stripped and cleaned from the seed, and when they are eaten, they only lie slightly. That’s why I wrote in the name that it was spicy; not hot. 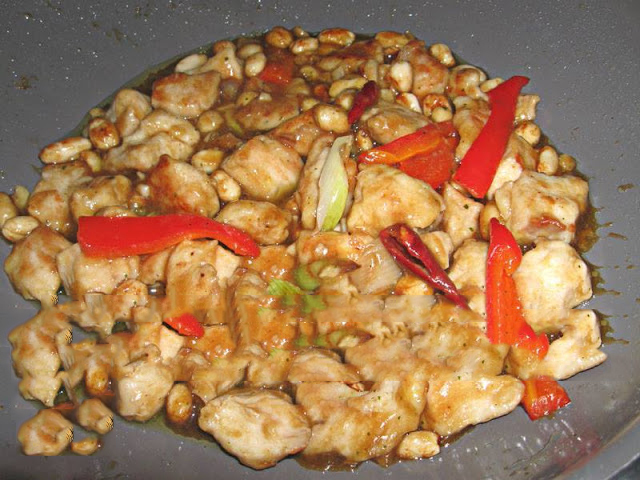 300 g white chicken, 1 egg white and 1 tablespoon corn starch, pinch of salt, 100 g peanut peanuts, the white portion of 6-7 stalks of fresh onions, 5-6 spoons of oil (peanut should be), 5-6 chili peppers, 3-4 cloves of garlic, a piece of ginger, red pepper, 1 tablespoon corn starch, 3 tablespoons light soy sauce, 3 tablespoons white wine, 1 tablespoon brown sugar, 2 tablespoons rice vinegar, 2 tablespoons sesame oil, 1 spoonful of sesame seeds. * Chicken is cut into bits of the same size. * Remove the whipped cream with a fork with a pinch of salt and starch, and with this mixture pound chips; stir and leave for 30 minutes to rest in the refrigerator. * Cut the onion into pieces about 2 cm (diagonal). * The chilli peppers are cleaved from the seeds. If the chips are large – they can be cut into pieces. * The oil is heated in the pan and fries in it for 2 minutes; they are taken out on a plate. !!! Here I will remind you, as I wrote above, that the peanuts are added to the peanuts at the end of the cooking. * In the same oil, chicken bites are fried until they turn red on all sides – for about 3-4 minutes. They are taken out of the peanut dish. * In the fat fry the crushed garlic cloves, the chopped piece of ginger, thinly cut peppers, onion and chilli peppers – for about 2 minutes. * Starch, soy sauce, wine, vinegar and sugar, along with two or three spoons of water, stir until the sugar dissolves. .
* Chicken bites are returned to the pan. * The sauce with the starch that we have already prepared is added to the pan – but not directly on the bites, but at the end of the pan and stir …… for about 2 minutes until this sauce thickens and all bites cover it 🙂 like a glaze. * Add peanuts, sesame oil, mix and immediately dispense in two dishes. * Sprinkle with lemon sesame – I will now say that, according to Master Minh, in Sichuan, the sesame is not pre-baked. Something we do here regularly when sprinkling a ready meal, or salads and starters – with baked nuts.